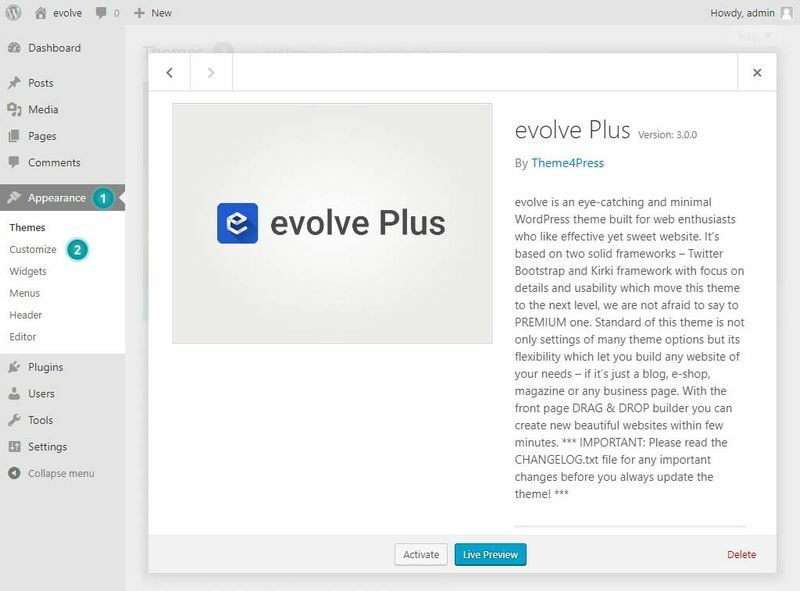 The evolve Plus theme comes with a Side Navigation template that lets you automatically put a set of pages into a group and then have a menu for the group appear in your sidebar. You do this by setting up parent and child pages. This menu automatically appears on each page in this group. Add a new page and name it something appropriate - 3. From the Page Attributes box, leave the Parent field blank (no parent at all) - 4 and change Template to Side Navigation - 5. 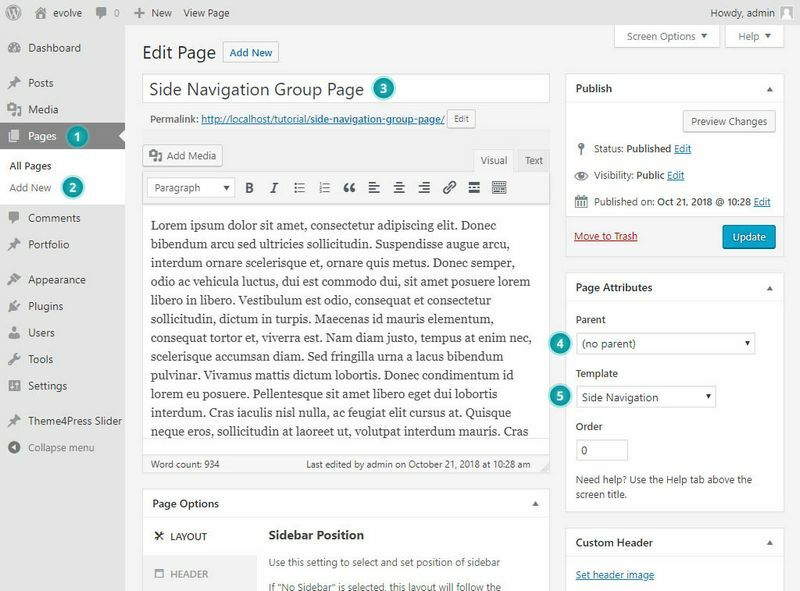 Add any content needed into the visual editor as needed. 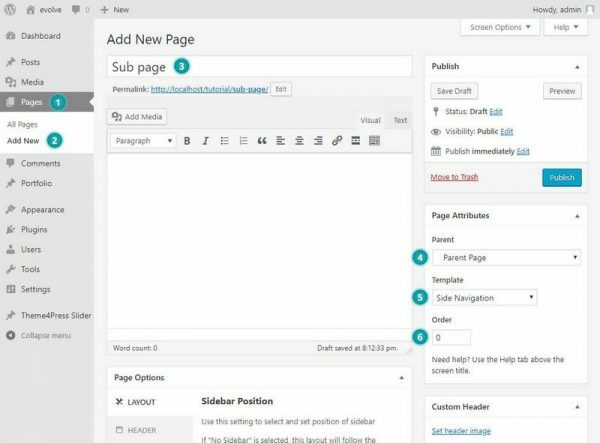 When everything has been completed, remember to hit the Publish button. 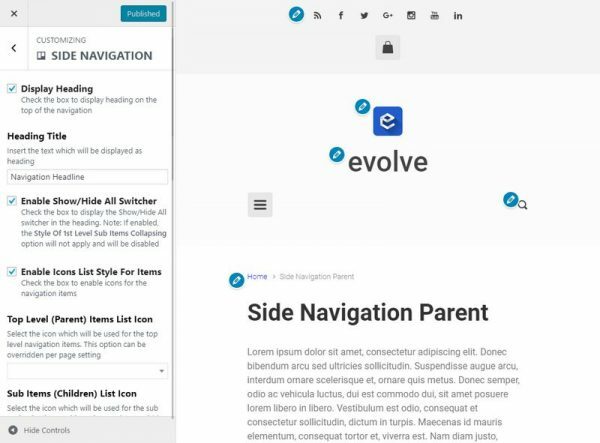 In order to add more side navigation menu items, simply create another page, and choose the just created Parent page as the parent - 4, and also remember to change the Template to Side Navigation too - 5. When everything has been completed, remember to hit the Publish button. When wanting to make a second level or more depth Sub page(s), choose an already created Side Navigation page as the Parent - 4, and ensure Side Navigation is set from the Template field located at the Page Attributes box - 5. 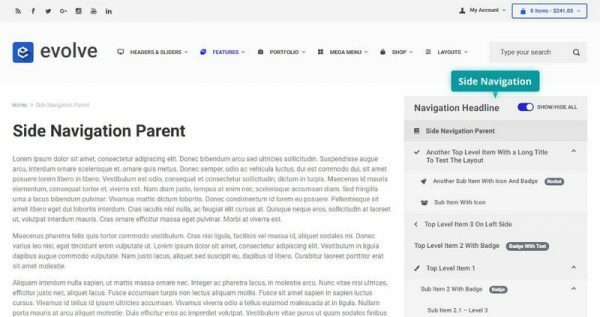 The parent template chosen must be a page that already has the Side Navigation set for Template. Set the Order if you like - 6. 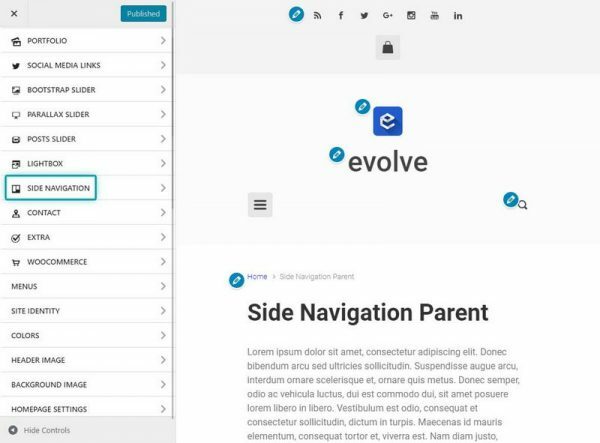 Default will be alphabetical. When everything has been completed, remember to hit the Publish button. 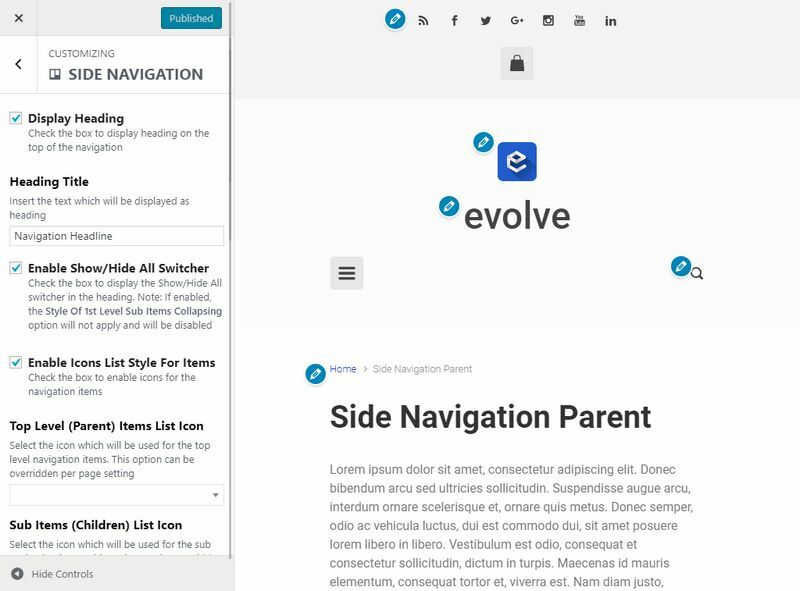 Below are instructions for configuring styling of the side navigation. 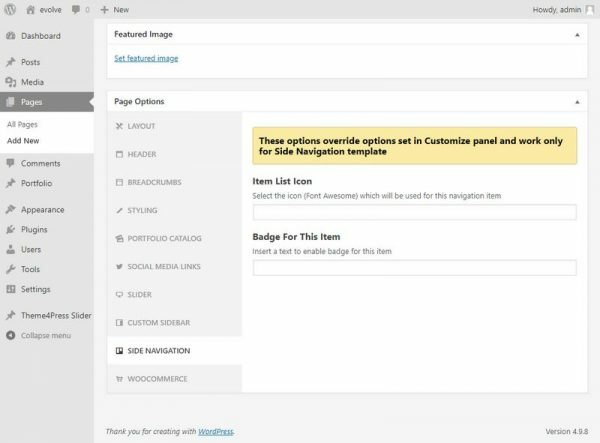 You will need to go to Appearance Customize Side Navigation in order to access controls for these options. 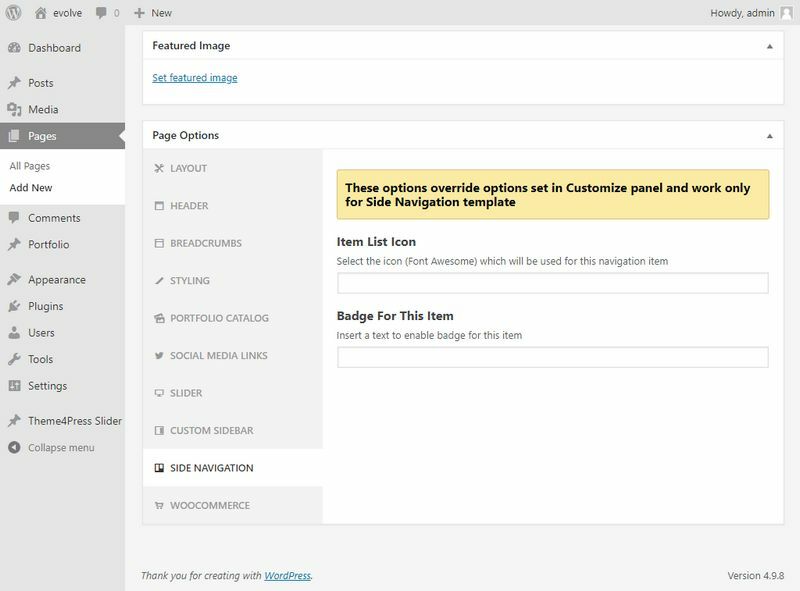 When adding a new group page, parent page or a sub item page, when you scroll down to the Page Options box and select the Side Navigation section, you can set an unique list icon to it which will overwrite the icon set through Customize Side Navigation Top Level (Parent) Items List Icon or Sub Items (Children) List Icon - if set. Also a Badge option is available which you can use to add an extra tag to any item. 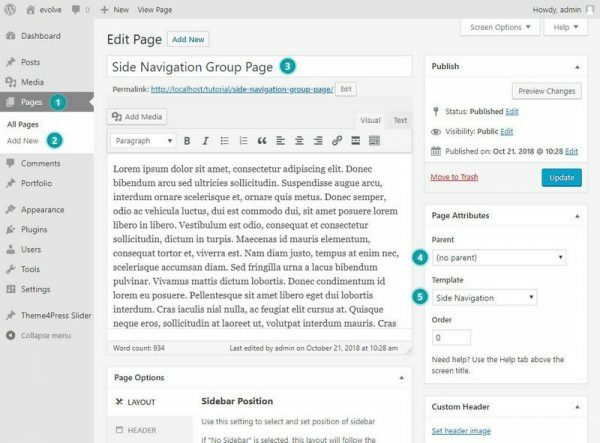 NOTE: It is possible to add as many side navigation page groups as you wish as long as the first group page is different for each group.